We are always keen for parents to get involved in their child’s learning and are happy to provide any assistance that could help with this. Whether it be details of maths methods, support with basic skills, extra application, etc. please ask your child’s teacher to supply what you require and they will do their best to help. We have invested in ‘Times Tables Rock Stars’, an online-based maths tool. Your child has been given a username and password and has been allocated times tables by their class teacher (at their level). Their teacher is able to monitor their progress, both as a class and individually – though the APP or the website, your child is also able to see their own improvements and progress. Make sure that our school is selected as the organization ‘Priory Cofe Primary School, Stoke-on-trent’ All pupils have their own password and username (ask the relevant class teacher if a reminder is needed). On this website, a number of games and activities are available for all year groups and ability levels. These games and activities are also used in class. Then click ‘home’ and choose the required activity. 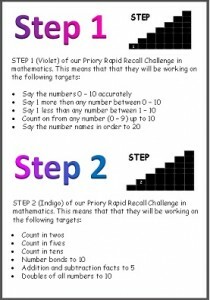 To help children practise and improve on basic number skills, we have been using Rapid Recall tests. These tests take 2 minutes to answer 24 questions of varying difficulty. Although some may seem simple, mastering 24 out of 24 marks in a short period of time takes some considerable skill. Below is a document detailing the skills required to progress through the Rapid Recall system. Please click the link below to view. The way that each year group is taught the 4 main mathematical operations (+, -, x, ÷) can cause some confusion. Here is the calculation policy to help you understand the methods we use in school and enable you to help your child understand them. Our Calculation Policy can found here.